Stars vs Plain Bellies ... but who can tell who apart? Intervention comes, in a 'music-man' sort-of way, as an entrepreneur named Sylvester McMonkey McBean arrives with a machine that can add or remove belly stars in a jiffy, confusing the Sneetches social order to the point of nonsense. Soon Sneetches are arriving and leaving Mr. McBean's machine in droves 'til no one can tell which bellies used to be starred and which were just plain. McBean leaves with fistfuls of cash, but the Sneetchs are left with a priceless lesson. Although each page is essentially a still image, many pages begin by panning over Seuss' classic original artwork, zooming in and out to show off each segment of text, a nice semi-animated style. Most of the items pictured in the story also react to a light tap. A visual image of the word with accompanying audio appears (for example, tap on the illustration of a star and the word "star" appears with audio saying “star”). If the word is also present in the text, it highlights there as well, providing lots of visual reinforcement for young readers. Overall this is a wonderful story app, lacking only a page guide to make navigation easier. If you love Dr. Seuss, there are lots of digital titles available as apps in almost any format. This book is also great for bedtime reading or storytime with multiple children, like in a classroom setting. Highly recommended! The Sneetches is the first story in The Sneetches and Other Stories, a collection of stories by Dr. Seuss, published in 1961. It is composed of four separate stories, "The Sneetches", "The Zax", "Too Many Daves", and "What Was I Scared Of?". The first two stories in the book were later adapted, along with Green Eggs and Ham, into the animated TV musical special Dr. Seuss on the Loose. The Sneetches is about a group of yellow creatures called Sneetches, some of whom have a green star on their bellies. At the beginning of the story, Sneetches with stars discriminate against and shun those without. A "fix-it-up chappie" named Sylvester McMonkey McBean appears and offers the Sneetches without stars the chance to have them with his Star-On machine, for three dollars. The treatment is instantly popular, but this upsets the original star-bellied Sneetches, as they are in danger of losing their special status. McBean then tells them about his Star-Off machine, costing ten dollars, and the Sneetches who originally had stars happily pay the money to have them removed in order to remain special. However, McBean does not share the prejudices of the Sneetches, and allows the recently starred Sneetches through this machine as well. Ultimately this escalates, with the Sneetches running from one machine to the next, "until neither the Plain nor the Star-Bellies knewwhether this one was that one... or that one was this oneor which one was what one... or what one was who." This continues until the Sneetches are penniless and McBean departs a rich man, amused by their folly. 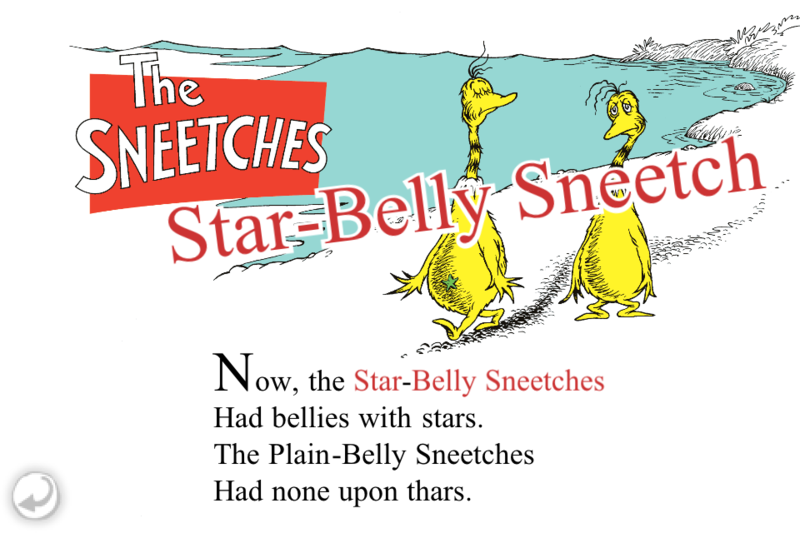 Despite his assertion that "you can't teach a Sneetch," the Sneetches learn from this experience that neither plain-belly nor star-belly Sneetches are superior, and they are able to get along and become friends.